First, I bought all fat quarters for these (and cut the muslin to fit each). I sewed the rickrack on the front side of the fabric, a half inch from the edge, all the way around. Then I pinned the muslin and the patterned fabrics together, right sides facing in, and sewed them together along the stitching where I sewed in the rickrack--leaving a 4 inch slot open so I could turn it right side out. Then I turned it right side out, pressed it all neat and flat, and sewed around the edge again, about 1/2 inch in. Napkin done. These are darling! Excellent idea to use the ric-rac! My husband's mother has a ton of vaguely mis-matched cloth napkins like this and I LOVE them! It's such a neat idea. She finds hers at thrift stores, I think, but has also made her own. I really like how you sandwiched the ric-rac between the fabric layers! Thanks everyone for the kind comments about the napkins--I did not expect even this many comments about the napkins as I thought everyone would find it sort of boring--but I love what you ohave shared. I am planning a new batch for this weekend--sans ric-rac though. 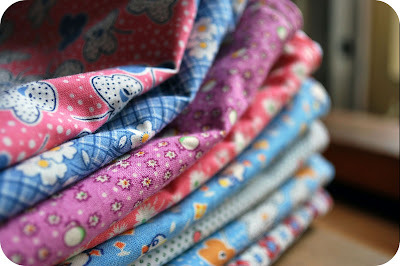 These are going to be straight-up single layer, hemmed napkins...I love the idea abou tucking one in the lunch bag--do find that you lose them along the way as a result? Holly, I love the rick rack on your napkins! Good tip for sewing it on! 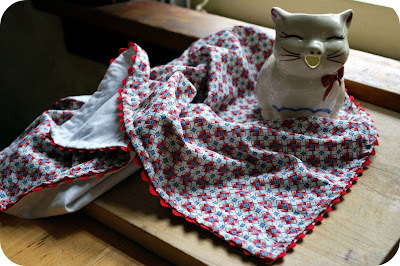 I just did an apron using rick rack, haven't sew with it in years, and that's just what I ended up doing! I think I'll make some like yours, they are sooo cute! i love them! we only use cloth napkins and love love love it! they are so fun and easy to make too! Holly, I adore your napkins! 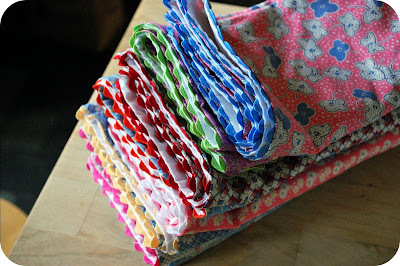 I usually set aside largish scraps to make napkins. I have a pile that I need to attack soon. Your ric-rac version is inspiring! I tried one of these right away and it's awesome I love the look and thank you for posting. I now have two sets of 4 fat quarters in blues and greens, muslin, and some orange rick rack I'm going to sew some sets up for gifts. Hey thanks to everyone for the comments on these napkins--these are some of my favorites for their simplicity and vintage-look sweetness. Also, I think they must have struck some balance with me of being easy enough to make but inspiring enough to look at that it allowed me to maintain motivation to make the 32 napkins that came after these...best of luck to everyone on their napkin creation. I would love to see photos--makes me wonder if I should start a FLickr group on napkins or something...is that going overboard? 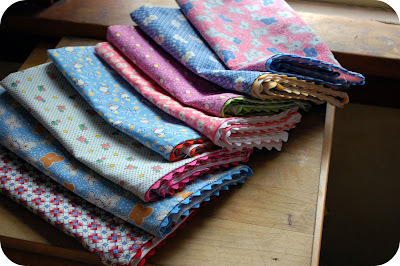 I was looking for napkin patterns and came across yours, they are lovely!! Is the fabric you used cotton or cotton blend. I had thought about making cloth napkins for awhile but my sewing skills are very very basic and I don't have a serger. Your post inspired me, however, and I made 20 adorable napkins. Truly, this is the easiest sewing project EVER. I didn't have rickrack, but I used contrasting material and they turned out really cute. Thanks for the idea and your blog is lovely!